There are a number of world class stairlift manufacturers across the world and within this blog post we will take a look at what makes these stairlift manufacturers so special and successful. First up is Meditek Stairlifts. Relatively speaking, quite a young company, which is almost 20 years old pioneering the design and manufacture of stairlifts. Along with the standard Straight Stairlift, Meditek have developed design a Stand and Perch stairlift which is great for people who have difficulty siting or bending their knees. Another Meditek stairlift produced by the company is the External Stairlift, designed to cater for the outside elements and used within outdoor environments such as gardens or cellars. A company that has their very own Elevator Technology section of their business. ThyssenKrupp are a proven stairlift manufacturer and one of the leading stairlift manufacturers in Europe, originating from Germany. ThyssenKrupp has a strong heritage within the area of both residential and commercial elevators. Producing high quality Stair Lifts, Home Lifts and Platform Lifts and focusing on Stairlift, ThyssenKrupp have produced three types of stairlifts, the Flow 2, Comfort and the Levant which is perfectly profiled in the video below. Stannah Stairlifts grew from the Freight or Cargo industry, have built lifts for moving ship cargo in the 1860’s. Stannah Stairlifts are regarded as a world class stairlift manufacturer, with a worldwide brand and have attained countless industry awards throughout its long history. 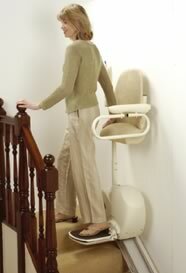 Stannah have manufactured the Starla Stairlift, which according to Shannah’s customers has a 5 star rating. If have any enquiries about what stairlift manufacturer you should choose to work within your budget, your home environment, we have Jacinta, Jen and Brian at the ready if you would like some impartial advice. They can be reached at 1890-837274 or email info@bmstairlifts.ie – or you can complete our free stairlift site survey and one of the BM Stairlifts team will be at your premises immediately.